Over the last couple months I’ve been trying to get my cross-country solo requirements out of the way. For the purposes of meeting the requirements to get a private pilot certificate, a “cross-country” flight is any that involves you landing at a different airport than the one you took off from, where the airports are at least 50 nautical miles apart (in a straight line). I was a fair bit more nervous about the solo cross-country (XC) flights than my first solo flight, because you really are kind of alone up there. When you’re going around the traffic pattern, that’s familiar, but when you’re going to somewhere you’ve never been with before, and you’re in the skies sharing the frequencies with the airline carriers, it’s something else. The first XC was a relatively easy one, as John had taken me on two XCs to Salinas before, so I knew what was going on. At Palo Alto, I called ground control to ask them for a left Dumbarton departure with flight following to Salinas. A left Dumbarton departure is one where you take off from the runway and hang a left at the Dumbarton bridge, which is a couple miles North of the airport. Flight following is basically a service that air traffic control offers to VFR pilots. When you’re flying VFR (visual flight rules) – in other words, flying by looking out the window – you’re pretty much on your own. You’re not speaking with air traffic control, and no one’s telling you where to go. (The exception is if you want to enter the airspace of a towered airport, then you need to talk to ATC.) When you pick up flight following, ATC keeps tabs on where you are. They help you spot traffic and guide you around it (although the pilot always has ultimate responsibility for avoiding traffic), and sound the alarm if your radar blip unexpectedly vanishes from their screen. I took the coastal route down to Salinas, flying over the Santa Cruz mountains, over Santa Cruz, Moss Landing and into Salinas. It was a nice, clear day, and a lot of GA traffic seemed to be heading down to Monterey. Palo Alto tower handed me off to Norcal Approach, and when I told them my intended altitude was 5500, they cleared me into San Francisco Airport’s airspace to get there (since it was above me at the time). SFO’s airspace is a category called Class B airspace, which is what surrounds all major U.S. airports normally up to 30 nautical miles in radius (the airspace looks like an upside down layered wedding cake). My flying club doesn’t allow students to fly solo into Class B airspace because it’s just a bit too busy in the Bay Area. (My instructor didn’t think much of that rule, and he gave me a Class B solo endorsement anyway, even though it’s just symbolic.) I declined the B clearance and ATC told me to stay underneath the Class B shelf. After overflying the mountains, I realized that there was almost nowhere good to land – it basically was miles of densely forested hills. 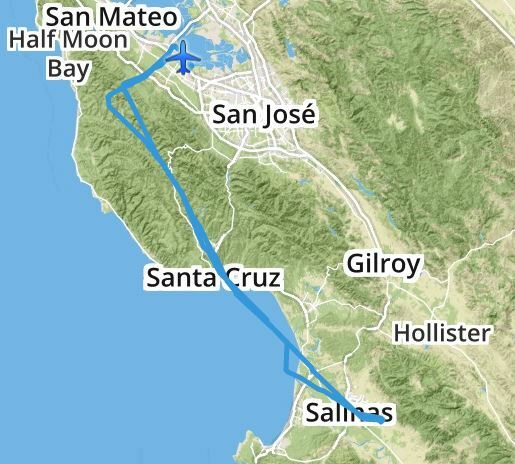 The alternative would have been to ask for a downwind departure and fly down the peninsula on the Bay side of the hills. But I’m not sure that it’s dramatically better – I guess you could land on the 280 in an emergency, but it’s still heavily populated, and the airspace is busier, especially as you skirt by San Jose’s airspace. I made it over the Santa Cruz pier and headed across Monterey Bay. Salinas was somewhere in the distance, but the ground was a bit hazy. I was vectored for traffic briefly, before turning back to the short. The airport came into view after I passed abeam the smoke stacks of the power plant at Moss Landing. Salinas’ tower works at a different pace to Palo Alto’s. The controllers speak slower and trip up on their words a little more, but on the other hand, there’s not a lot of traffic there so there’s no need to speak quickly. I joined the downwind too close to the runway and overshot final by an embarrassing amount. No matter. I landed, taxied back, and took off for the return journey. On the return, Norcal Approach twice asked me to confirm my destination was Palo Alto. 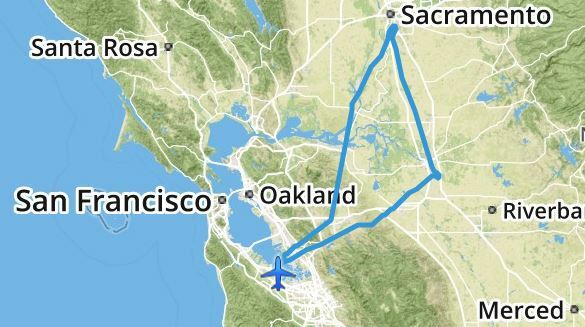 The second time, I realized they were asking because they were curious – the direct route back to Palo Alto would have been via the Bay side of the mountains, but I was heading up via the mountains and then to Woodside, where I’d make a right turn and cut back in towards the Bay. But they didn’t know that, so I told them I was going to Woodside first. John told me later on that I should have mentioned any unusual routes when picking up flight following so they don’t get confused. Our normal practice area is up near Woodside, and that afternoon was swarming with students doing maneuvers. “Cessna 1SC, caution multiple targets,” I was told. I always find that terminology peculiar, since targets connotes something you’re trying to aim at, and in this case you’re most decidedly not. I cut back over the hills into more traffic. A Cessna ahead of me was also going to Palo Alto, and I was told to follow him. A Surf Air Pilatus was also crossing in front of my path from right to left. “1SC has traffic in… uh… that traffic in sight as well,” I responded awkwardly as my eyes were glued out of the window. Back in Palo Alto’s familiar airspace, I put the plane down and was exhausted. The second XC was my “long” solo XC, which requires landing at 3 different airports, separated by at least 150 nautical miles. John set up my route to Stockton (where we had been once before) and Sacramento Executive (which we had not). Although both were large, towered airports, they were supposed to be relatively sleepy places. I asked for a right Dumbarton departure, headed to my default Eastbound waypoint of the Sunol golf course, crossed Mission Pass and was in the Central Valley. Pleasanton to the left, Livermore below, wind farms, and then miles upon miles of fields. The weather in the Central Valley at this time of year is pretty consistent – warm to hot (low 30s Celsius) and clear skies with some haze. The flight to and landing at Stockton went fine. After landing at Stockton, I contacted the tower instead of ground because the flip-flop switch in 501SC is sticky and has a habit of flipping twice when you press it once (and I didn’t double check the frequency change). Tower set me straight. Then in the runup area, I wasn’t sure whether I was supposed to switch over tower or wait until ground told me to switch (it’s meant to be the former), and ended up deciding to make a call to tower, except that I had forgotten to switch over to tower and was still on ground. Oh well. The tower kindly set up flight following for me to Sacramento. Stockton tower wished me a “safe flight” upon departing their airspace and I wonder if they chose that valediction because they figured out I was a student pilot. I made a right 45 departure from Stockton and decided to set the autopilot. I told Norcal I was going up to 4500 and set the auto pilot. I mustn’t have set something correctly, because auto pilot blew through 4500 and I only realized when I was at 4600. I tried to fiddle around with the autopilot to try and fix it, and unthinkingly tried pushing down on the yoke with autopilot still engaged (to which the plane responded with a verbal reprimand, although I can’t remember what it said – something about trim). By the time I finally got with the program and disengaged the autopilot, the plane was almost at 5000 feet. I found Sacramento Executive without much of a problem, made a good approach and then spoiled everything with a horrible landing. Ballooned, lost a bit too much airspeed, and came down a bit hard and bounced (at least it was on the rear wheels!). Then I slammed on the brakes and the tires were screeching (I wasn’t sure why because they don’t normally). The departure was the worst part of the flight and a great learning experience. Sacramento Executive Tower had cleared me for a straight out departure and told me that I would get my squawk code “in the air” (the code that lets ATC track you when you have flight following). I took off and moments later was given my squawk code. I was about to type it in, when it was followed by a traffic advisory at 11 o’clock. So I diverted my attention to looking for an RV that was coming in to land and entering the downwind. In the meantime, my GPS navigation was showing that the next waypoint was off to the left, when it should be straight ahead, and I was confused. The tower radioed in again and asked me to set my squawk code. Followed by another traffic advisory. Meanwhile I’m trying to concentrate on take off and pitching to the right angle and bringing up flaps. Tower radios and asks me why I’m turning left. And I’m not trying to, but I had hit task saturation in trying to attend to the take off, squawk code, traffic, and the weird GPS issue. The result was that I dropped the ball on my heading and had started to drift off to the left. I had just finished setting my squawk code when tower radioed again, this time very irate, and told me to set my squawk and what the hell I was doing still turning left (he didn’t say “hell” – they keep the words professional in the air, although the tone sometimes isn’t). Still a bit confused, I asked what heading I should be on and was told that I had already turned so it didn’t matter, and that I wasn’t supposed to turn until I was told to. Later on, I realized the GPS was still using the previous flight plan and I hadn’t activated the flight plan for the next leg, so it was showing the old inbound track to the airport. 1. I could have asked to wait for the squawk code on the ground. That would have been one less thing to worry about during a critical stage of flight. 2. I had my priorities wrong and should have completely ignored the GPS – while I was under tower control, my focus should have been on following their instructions and not on something that really didn’t matter at that stage. 3. I could have set a heading bug when lining up on the runway. 4. I could have mentioned I was a student pilot. Anyway, I was a bit shaken up after that. Fortunately, the final leg was the longest one, and I had a bit of time to relax a little and take in my surroundings. I set auto pilot again, watching the altitude like a hawk. It blew through my target again, but this time I was ready for it – I disengaged autopilot, leveled the plane and put the autopilot into altitude capture model. I had some great views on the way back, with Mount Diablo passing by my right wing. Getting back to Palo Alto was relatively uneventful, although I had another poor landing. It was a 2.5 hour flight, but I felt completely wasted. When I got home I took a nap. You need to clock 5 hours of solo XC time, so I needed to do one more solo. This time, John sent me to Oakdale, which was near Modesto. Oakdale is a small, single runway untowered airport in whoop whoop. I had only been to one untowered airport – Half Moon Bay – and only once, when there wasn’t anyone else in the pattern at 8am on a weekday. I thought Oakdale wouldn’t be too bad because of its location, and the fact that my course in would be a 45 entry into the left downwind, so I didn’t have to do any maneuvering to get into the pattern. Norcal terminated flight following, and I switched over to the CTAF frequency for Oakdale (the common comms frequency that people talk on when there’s no tower). I was immediately hit by a barrage of position calls for Oakdale. At 1500 feet, I was having trouble spotting the airport. And I hadn’t the faintest clue where the candy factory or ammo depot were. They weren’t landmarks on the charts. And what was Young Eagle? I immediately began to get very nervous. It was clear there was a lot of traffic in the area, and I didn’t know where any of it was. A plane – it looked like an old military prop plane – materialized off my right wing. He was flying on the 45 for a left downwind entry like me, and I didn’t know what to do. I recalled something about a plane on the left having right of way or something (the correct answer is actually that the plane on the right had right of way), but in the time I was searching my memory banks, the other plane had quickly sped ahead, resolving that problem for me. I fell in behind him. “Ok, I think I’m number 3,” someone said over the radio. Hmm. I started quickly scanning the pattern. There’s one plane on short final. Another turning base. Don’t see anything else… that can’t be good. Is number 3 behind me? What number am I? Then I saw number 3 ahead of me on the downwind. I put in 20 degrees of flaps and slowed down more, waiting for the plane to turn base and final and pass me before I turned base. Ok I hope I’m number 4 and I didn’t cut someone off who thought they were number4 . I finally got on final, saw the plane ahead clear the runway, and relaxed. The landing was a decent one. On the ground, there seemed to be a bunch of people in older military-style planes going around, but I taxied past them all back to the runway and didn’t get a good look. On the way back, I got vectored around some skydivers and had some traffic to look out for, but otherwise had an uneventful return. Just saw The Martian. Best movie of the year for me. I watched it with a group of five friends – each with a PhD* in various fields – biology, quantum physics, applied physics, and two in electrical engineering. (They could’ve stood in for the crew in the movie!) They thought the film was pretty legit in the science department, so I’ll take their word for it. If you like science or space, go watch it. If you have young kids and you want to see if you can kindle or stoke their interest in science, go and watch it with them. Really enjoyable, engaging movie. I found their casting decisions to be really positive – it felt more diverse on the racial and gender front than I would have expected for a Hollywood production. I think it must have been a conscious decision to cast a woman as the mission commander – she has to make some very tough decisions to make in the movie, and she makes them in a way that unambiguously shows she’s a strong leader. Fictional characters can make great role models, and the women leaders in The Martian can inspire the girls who watch the movie to aspire to the same. I also found that the Chinese tie-in was interesting. There’s of course the heartwarming angle about scientists cooperating free from politics (and it’s a good reflection of how scientists around the world really do collaborate on all manner of projects). But ironically, politics has also probably influenced those scenes being in the movie. That’s because the political climate of the day often dictates who plays the villains in movies. During the Cold War, the Russians were always the bad guys. These days, the Russians are making a comeback of sorts – there are so many movies and TV series these days where the Russian mob is involved. On the other hand, I think Hollywood has backed off from casting Chinese as the bad guys. My theory is that it’s driven by financial interests. The Chinese movie-watching market is a huge one, and you don’t want to alienate such a large audience by casting their country in such an antagonizing way. The Chinese are also starting to reach out to Hollywood with financing (did you notice the Alibaba Pictures logo at the start of the latest Mission Impossible?). It’s also not good to antagonize your funding sources. The Chinese tie-in also recognizes the rise of China as the world’s second largest economy and the ascendancy of its space program. The movie also kind of gave a shout out to lawyers as well! I actually studied space law in law school and participated in an international space law mooting competition, so it was cool to hear the bit about space pirates! Anyway, go see the movie.